At TechCrunch Disrupt NYC back in April, former Facebook exec-turned-venture capitalist, Chamath Palihapitiya delivered a deflating critique of the tech industry — in particular, the quality of its startups. Had he been issuing a report card, the Tech World would have gotten an “F,” with an extra side of “shame.” His frustration seemed to emanate principally from the fact that “Big Ideas” are few and far between in the industry today. Rather than aiming high, he intoned, entrepreneurs seem content to reach for low-hanging fruit despite the diminishing returns inherent to that approach. While Big Ideas may not be at all-time high, today’s news brings some assurance that they are still alive and well in the tech industry — and that there’s even capital to support them, for-profit or not. Watsi, a Y Combinator-backed healthcare crowdfunding platform, is tackling one of the biggest: That more than one billion people can’t afford (or don’t have access to) adequate medical services. Even Chamath would likely agree that falls in the “Big Idea” camp. Today, the non-profit crowdfunding platform announced that it has raised $1.2 million in what is its first round of financing, or “philanthropic seed round,” as the startup is calling it. Granted, if Watsi is setting its sights high, than $1.2 million will only be a drop in the bucket compared to the capital and resources it will need if it truly hopes to make a difference at scale. A good start, to be sure, especially when considering the impressive roster of names contributing to its first financing, which includes institutional investors, like China’s largest Internet services portal, Tencent, Y Combinator partners — including personal investments from founder Paul Graham and YC Partner Geoff Ralston — along with the “godfather of angel investing” and owner of the most pristine coiffure in the Valley, Ron Conway, Sun Microsystems and Khosla Ventures co-founder, Vinod Khosla, venture philanthropy fund (and Kiva investor), The Draper Richards Kaplan Foundation and Flixter founder and Rotten Tomatoes CEO, Joe Greenstein — to name a few. While the list is impressive, it’s not a group of investors one would typically find contributing to a non-profit fundraiser. Watsi founder Chase Adam explains that the reason the company opted for this approach is that the traditional mechanisms for non-profit fundraising sometimes act as a counterproductive force by undermining the social movements they’re trying to support. Instead of devoting themselves to their “Big Idea,” socially-minded entrepreneurs often spend their time entering online voting competitions and hosting banquets to raise money to support their operations. Instead, Adams hopes that the collection of VC, angel and institutional donations represents a move toward a new future of non-profit fundraising. Granted, Watsi is in the unusual (and fortunate) position to have been the first non-profit startup to be accepted into Y Combinator and to have had the vocal support of Y Combinator’s founder, Paul Graham, who also recently accepted a seat on the startup’s board — the first time he’s done so for a YC incubation. In reference to this question, Graham suggested to Watsi that they call this raise a “Series N” (non-profit and n=variable). On the flip side, Adams tells us that he set a three-month deadline for fundraising, deciding to go after industry leaders and big names in the angel and venture world, regardless of whether or not the efforts proved to be successful. By doing so, the Watsi founder hopes that this might help encourage other social businesses to consider forgoing traditional sources of fundraising. Ben Rattray, the founder and CEO of social action platform Change.org and I recently spoke on this very subject after the socially-minded for-profit company closed its own $15 million round of funding. As a for-profit business, there’s more pressure for Change.org to raise institutional or venture capital. As a non-profit, Watsi would likely be more attractive to investors, whereas Big Idea-based, for-profit companies have traditionally found it difficult to raise money from these types of investors. However, both Adams and Rattray share similar goals, as the Change.org founder that would enable them to remain independent without having to constantly be looking for a one-time liquidity event. “These kind of social enterprise businesses are working over the long-term, 15 to 20 year windows, which is beyond the scope of most venture capitalists,” Rattray said at the time. However, he believes that it’s going to change: “I have no doubt this is going to change — that eventually more investors are going to start backing socially-conscious businesses,” Rattray says. And it’s for that very reason that I think the juxtaposition of Watsi and Change.org is worthwhile. Although perhaps idealistic — and, admittedly, Watsi is a non-profit, perhaps the startup’s funding is the first sign that it is, in fact, beginning to change. 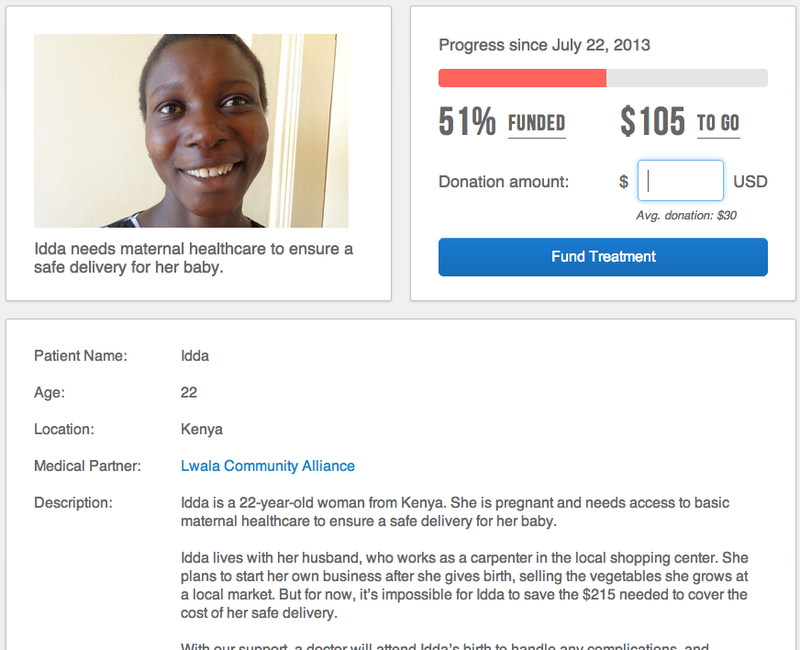 Nonetheless, for Watsi, this raise is an important validation of its own ambitious, “Big Idea” goals. Of course, eliminating poverty or fixing global healthcare and covering the uncovered, don’t happen over night and aren’t solved by one person or one founder. That’s why Watsi is leveraging the “many hands” approach of crowdfunding to let anyone contribute to the funding of low-cost, high-impact medical treatments for those in need. Furthermore, the platform automatically creates profiles for those in search of financial support for treatments or surgeries and makes it easy to make direct donations. Furthermore, these profiles, besides providing critical transparency into how your donation will be used and actually help someone, it also works towards attaching actual, human faces to global poverty — which sounds cheesy but is critical to conditions or problems like this that are so huge that providing real faces, one-by-one, can help discourage, say, just ignoring it and hanging for a lower-hanging fruit. 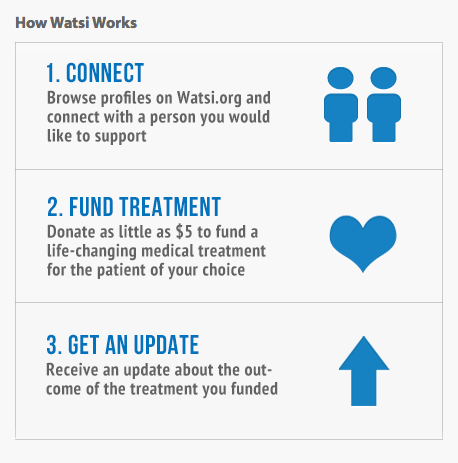 To further incentivize donations, Watsi offers 100 percent of the donations it collects from the crowd to those in need. Graham also says that the startup is paying “all their operational costs from their own funding, and none from your donations,” and in turn, even stomach credit card processing fees. A noble gesture in its own right.